Traditional Pub At It’s Best! 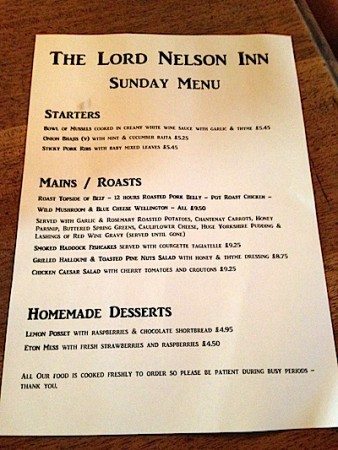 When I was asked to visit the Lord Nelson to sample their Sunday roasts, I wasn’t sure what to expect. Situated in the busy North Laines on Trafalgar Street (the road that leads to the station), this pub has been there for as long as I can remember but yet I have never found the time to venture in. How this could now change! On arrival, we were warmly greeted by Alex who was behind the bar – he made it apparent that nothing was too much trouble for him and ran through the roasts with us whilst we chose our drinks. This pub is a Harveys pub, so think lots of cask and seasonal ales on tap. However, due to myself and my dining companion (Dad this time! )not being beer or ale drinkers we both opted for a fruit cider and headed to our table. 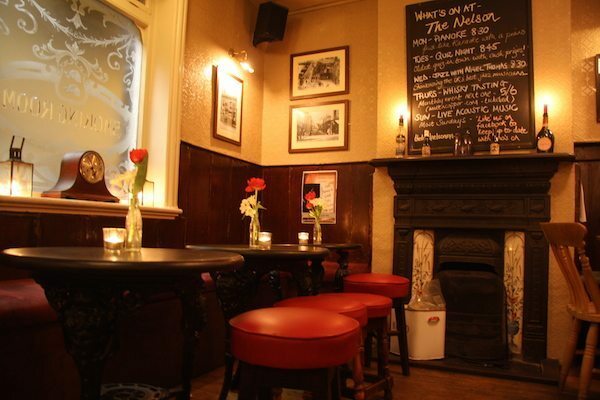 The pub is a proper old school place, think big fireplaces, central bar with the traditional ales, carpets and heavy furniture. The clientele in on that particular Sunday you could tell were regular locals and there was a great sound of belly laughter resonating around the bar. Gentle music was playing in the background, but not so loud that you couldn’t have a conversation – something that can be quite difficult in the more modern or commercial pubs today (I sound so old!!). Out the back there is a big conservatory area and there seemed to be some kind of meeting in there. It was only as they left that I could read the club name on the backs of their t-shirts – The Saxon Beard Club, which would explain the hairiness of a lot of the gentlemen in there! 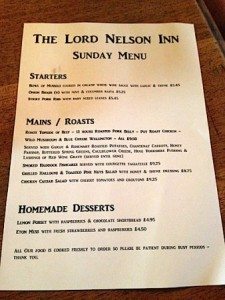 There are four options of roast available: Roast topside of beef, 12 hours roasted belly of pork, Pot roast chicken and Wild Mushroom & Blue cheese Wellington. 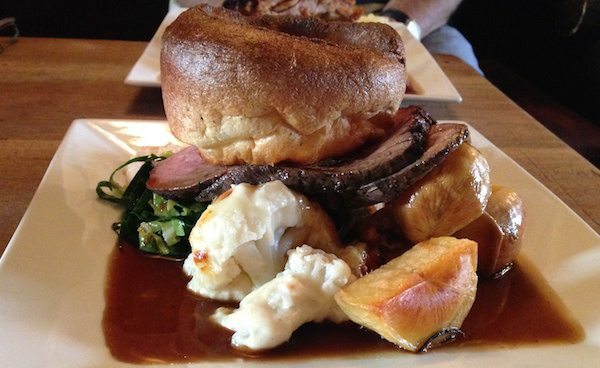 All are served with garlic and rosemary roasted potatoes, Chantenay carrots, Honey parsnips, buttered spring greens, cauliflower cheese, huge Yorkshire puddings and lashings of red wine gravy. All priced at a very reasonable £9.50. I went for the beef and Dad decided upon the roasted belly of pork (without all the greens or carrots – he doesn’t do veg!). When they were served to us by Alex the plates did not disappoint. 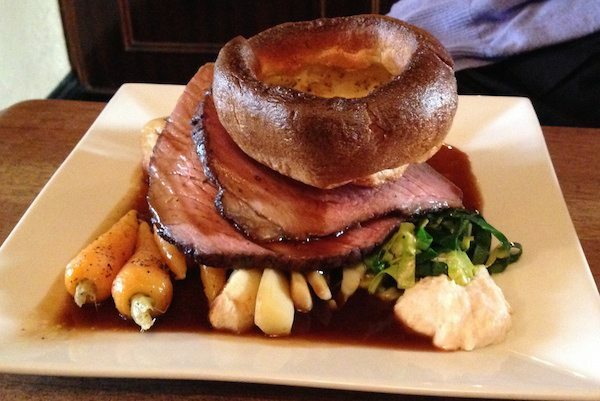 They were beautifully presented and packed with food, we knew we were in for a treat! 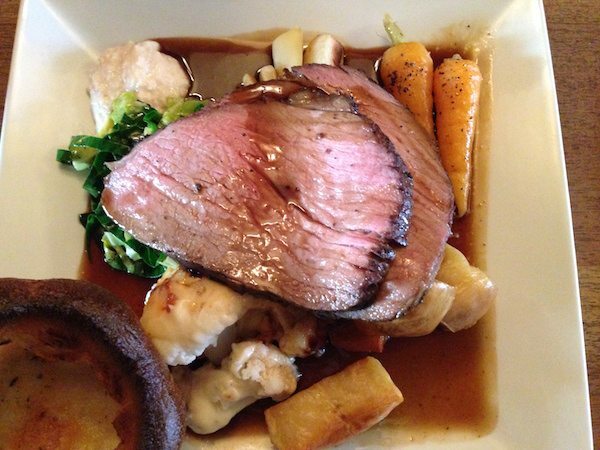 Four Roast Options – And dad does not do veg! 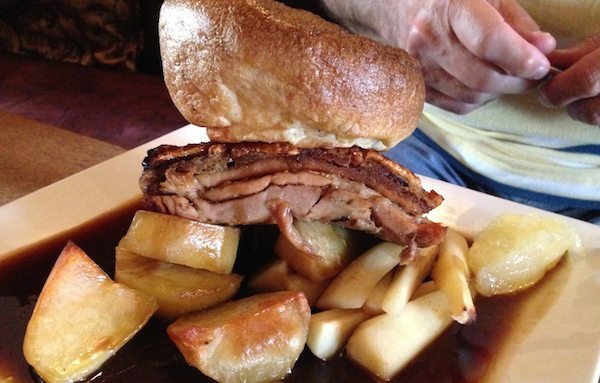 Dad’s pork was a huge portion with proper crackling on top, the meat was tender and fell apart at the touch of a fork. My beef was cooked beautifully (medium rare) and the slices were thick and well seasoned. A nice touch was that the traditional accompaniments were already to the plates, yummy apple sauce with the pork and a horseradish sauce that really packed a punch with the beef. The vegetables all complemented each other well. The garlic and rosemary roast potatoes were so crunchy on the outside, but lovely and fluffy on the inside. The cauliflower cheese was exactly how it should be – cheesy! The vegetables were all fresh and cooked al-dente (just they way I like them). 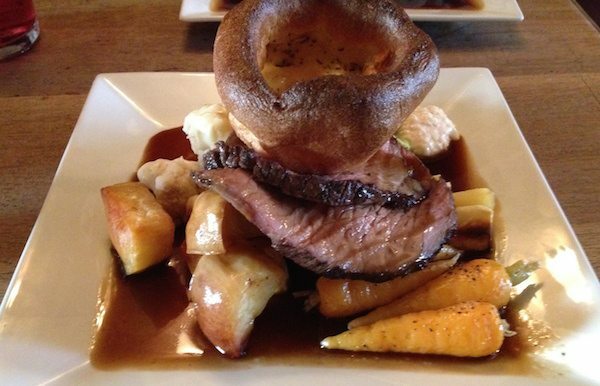 The description of the Yorkshire puddings was spot on – they really were huge and the red wine gravy was delicious. We both were not surprisingly quite full after all that, but Julian managed to persuade us to try his desserts, and so we decided to share an Eton Mess (£4.50). There was plenty of fruit with lashings of cream – it was great, and well worth finding that little extra space to fit it in! All in all, I think I’ve discovered a real gem of a place. We had a really relaxing time and it was clear that we were welcome to stay as long as like to digest and enjoy our surroundings. 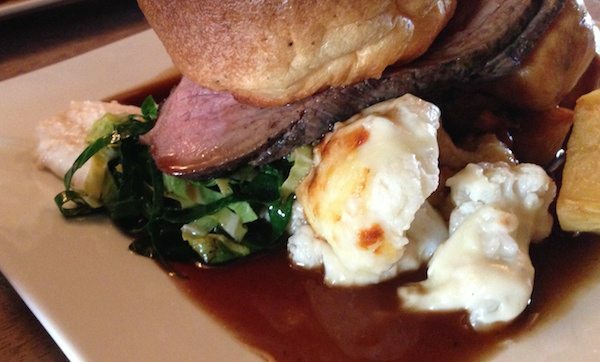 This pub has a great atmosphere, superb food and staff that really do look after you. I’ll be back!